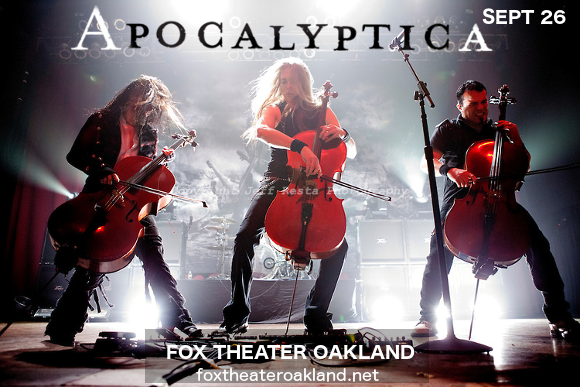 Fans of metal, classical, or all music that is truly unique, get ready for one of the most revolutionary acts of the last 20 years; it’s the metal cello band Apocalyptica, coming to rock the Fox Theater Oakland on Tuesday 26th September 2017!! Tickets will disappear for this immensely popular act, so don’t delay – get your tickets to see the band TODAY!! Apocalyptica saw its beginnings in Finland in 1993 when classically cellists and members of the same orchestra – Eicca Toppinen, Paavo Lötjönen, Max Lilja, and Antero Manninen – thought it would be a good idea to get together and play Metallica covers on their cellos. After their first performance at Sibelius Academy, they were approached by a label employee, who encouraged the band (who were at first reluctant, thinking nobody would want to listen to the music!!) to record an album. Eventually, the band released their first album “Plays Metallica by Four Cellos,” comprised solely of Metallica covers, in 1996. Contrary to their expectations, the band saw a great deal of public interest and started to develop a following. Encouraged, they went on to release “Inquisition Symphony,” in 1998, their first to include original material alongside covers by various bands including Sepultura, Pantera, and Faith No More. As time went on and fans maintained a strong interest in the genuine musicality of the band themselves – as opposed to the short-lived novelty appeal of metal on classical instruments – the band gradually reduced the number of cover songs on each album, eventually releasing “Reflections,” their first album of all-original material, to enormous critical acclaim. Don’t miss your chance to catch their phenomenal artistry and genre-bending uniqueness live – get your tickets to see Apocalyptica NOW! !